Bernie Sanders, self-labeled as an Independent, but based on this article (h/t Vermont Digger) might find himself on the unhappy side of the Antifa movement, recently suggested that the USG specifically tax Jeff Bezos’ Amazon company in order to pay for federal benefits programs that some Amazon employees use. No mention of how Amazon’s corporate taxes are already going to pay for entitlement spending, but hey, let’s not confuse Grampa Bernie here. Oh, and the salaries of the people paid at Amazon, at any wage rate, are taxed, and go to pay for entitlements. In other words, Amazon is already paying for entitlements. No word on Sanders being willing to increase his own Senate salary’s taxable rate due to his under-payment of staffers, in terms of a living wage. Oh, wait, that’s right – Bernie doesn’t pay for their wages, out of his end. Taxpayers do. In the corporate world, increased costs in the form of taxes are simply passed on to the consumer through price increases. When prices go up, demand goes down, and soon those people Bernie now deems to be eligible for even more government assistance are now out of a job, because fewer people demanding their firm’s products means they’re less likely to have a job. Which would increase demand for government assistance. Well done, Senator. If there’s more sand available for you to scoop up and throw into the gears of commerce, maybe take a break for a week or two. Give the rest of the country a chance to earn their living without the guidance of a failed Communist and public leech. Oh, well – stop the presses. 100,000 people out of a population of 323 million said they’re tired of Bezos. By all means, now let’s enable the takeover of private capital by the federal government, and truly institute fascism – Bernie style. In this scenario, the government won’t own the means of production, but instead, the government will direct the operations of corporations it deems are failing to align with what aging politicians think they should pay their employees, while the politician continues to get to choose from which one of his three homes he gets condescend to us from. Yet – there’s still more! What other company features low-paying jobs for low-value work, that Bernie can fix via congressional fiat? WalMart! “While Mr. Bezos is the most egregious example, the Walton family of Walmart and many other billionaire-owned large and profitable companies also enrich themselves off taxpayer assistance while paying their workers poverty-level wages,” Sanders said. In this idiot’s version of economics, somehow entitlement spending goes directly into the pockets of the Walton family, which they probably set fire to and laugh while putting their feet up on the backs of newly-hired WalMart employees. The bulk of these jobs are literally jobs that anyone can do, which is why you don’t see doctors or PhDs applying for warehouse gigs. You don’t need a special skill set. All you need to do is be trainable and show up on time. Having no unique values means you’re less likely to be paid more in the labor market, because there are hundreds of thousands or potentially millions of people who can do that same type of work. 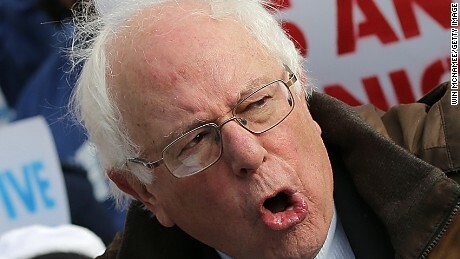 Given that Bernie has been given a free ride for 4 decades or so off the backs of people who pay taxes, it’s no wonder he doesn’t understand why a lack of specific skills shouldn’t entitle you to a higher salary. After all, he’s been well compensated for doing literally nothing all his adult life. Fascism comes in many forms. Maybe at the tail end of Bernie’s career, he’s making that final, inevitable pivot from “independent” to what he truly wants to be, which is an economic dictator. — Chris Campion blogs at dangerwaffles.wordpress.com. That’s what I call calling it as it is!!!! Good for this guy. Chris Campion has “Grampa” Bernie pegged exactly right. How that man who is a self proclaimed Communist has continually won election in Vermont is puzzling. Easier to believe they can get everything & not suffer any disastrous consequences as promised by Bernie than to think for themselves & know that can not go on forever as the money makers disappear along with the jobs & taxes they provided..
Senility is a terrible thing to waste, and then you die. Sayonara, Bernie.